No matter your industry or size, many merchants can benefit from this affordable and effective tool. 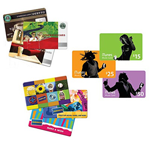 Although aware of gift cards, some are unsure if this solution is right for them. We will show you how this easy, effective service can increase consumer awareness and sales. Gift cards have multiply marketing opportunities that go beyond a customer gifting to friends and family. They can be used a promotional tools, raffle prize, either in-store or remote locations like TV and radio stations, websites, conventions, associations and bureaus. Special incentives for gift card purchases allow other individuals and business owner to distribute cards as bonuses, gifts, event give-aways and more. Gift cards can also allow you additional uses to increase customer confidence, while insuring that money will be spent at your store at a later date. For example, gift cards grant you a second chance to make a good impression with an unhappy customer, a means to issue a store return credit, and to bonus your suppliers, service providers and employees.